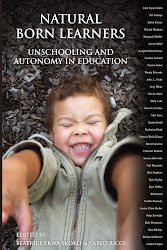 I have a paper in the the new issue of The Journal of Unschooling and Alternative Learning. I keep a blog about self directed, authentic learning and recently, I read an article called “Blogging with Audacity” written by Skellie, a woman who'd studied what makes a successful blogger. As I read, I noticed that her ideas about blogging audaciously parallel the very attitudes I would prescribe to approaching learning. I describe 'the audacious learner,' as exhibiting desirable behaviour to learning new things: that is, being daring and taking risks. All breakthroughs, new ideas, original thoughts are acts of bravery. Getting to something fresh means first stepping into the unknown. What does it mean to take risks when it comes to learning and acquiring new skills? To start, there has to be interest. Without interest, learning is a very unpleasant affair. You can nurture it, but you can't teach interest. This belongs to the individual; it has to come from the learner. When you are enamoured by what you are interested in, keen to find out everything there is to know about it and then some, there is no question of allowing fear to stand in the way; this is a hallmark to being an audacious learner. Great blogging, Radio Free School. Thanks for all your insights and hard work. Thank you Danae. We aim to educate! Great piece! Learning with audacity-we could use a little more of that!